While you may know Subaru for their off-road performance and dependability, the all-new Subaru BRZ is dominating the asphalt with its performance. High-adrenaline white-knuckle driving is what engineers were aiming for when they designed this speedster. Here at Hassett Automotive, we have trouble simply taking our eyes off the BRZ. So what’s so special about the Subaru BRZ performance? The unique 2.0L Boxer engine gives the model incredible acceleration, as evidenced by the 6.4 second 0-60 mph time. Paired with a specially designed 6-speed manual transmission, you’ll be glued to the seat. What makes the BRZ truly special is in the engineering, though. A limited-slip differential drastically improves steering, as well as the exclusive rear-wheel drive system. A four-wheel independent suspension is something rarely seen on the road, as well as the anti-roll bars in the front and back. This sports coupe stays glued to the road and can overtake its opponents on every corner. If you’re looking for a down-to-earth sports car that’s incredibly fun to drive, look no further than the BRZ. Once again, Subaru has proven its dedication to safety as the 2014 Subaru BRZ is named a Top Safety Pick by the Insurance Institute for Highway Safety. The sports car scored a “Good” rating in the front moderate overlap test as well as the side and rear impact and roof crush evaluations. It received an “Acceptable” rating for its first front small overlap test. The BRZ is now one of seven 2014 Subaru models honored with safety distinctions from the IIHS, one of four designated as Top Safety Picks. The car offers a 200-hp BOXER engine, an efficient 34 highway mpg performance, and award-winning safety all for a starting price of $25,595. 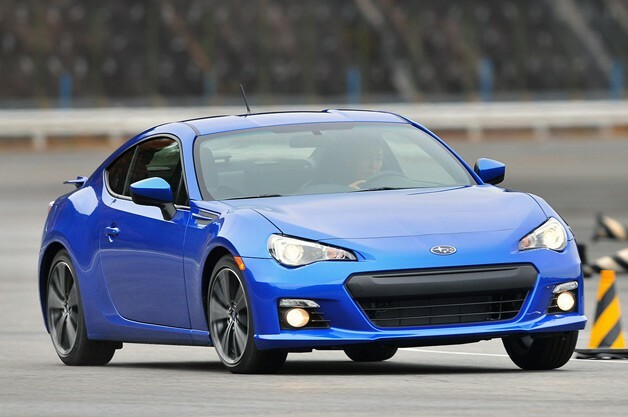 Naturally, you’ll find the 2014 BRZ along with Subaru’s other distinguished models right here at Hassett Automotive. Remember that first rush of excitement you got when you drove for the first time? Cornering, acceleration, braking, and even putting the car into gear was new and fun. Then you grew older, got a job, and driving became somewhat less fun and somewhat more robotic. Well Subaru’s newest sports car, known as the BRZ, plans to put that same kind of zest back into the daily commute. Developed in a joint project between, Subaru and Toyota, the BRZ is a low-slung, rear-wheel-drive saloon, with a penchant for curvy roads that let it show off the spectacular handling it possesses. Inspired by the Porsche Cayman, Subaru set out to build the perfect “pure handling sports car” and many critics are commenting that the Japanese automaker nailed it. While some readers may be puzzled why Subaru, who makes fantastic AWD vehicles like the new 2012 Impreza, is dabbling in RWD sports cars. Its because Subaru understands that drivers crave excitement and quality performance. Take one look at the Subaru BRZ in the video below and we defy you to say it does’t look fun to drive! If you like what you see, then wait until Spring 2012 when the BRZ will be coming to the US. Hassett of Wantagh is proud to offer quality Subaru vehicles and we can’t wait to see more about this amazing vehicle.